Is a major Protestant denomination with roughly 6,000 congregations. The style of the United Church of Christ is one of openness and acceptance. The United Church of Christ historically traces back to God's mighty act of creation and God's saving deeds in Jesus Christ. With approximately 500 members, includes people of all ages from a great variety of vocational and religious backgrounds. We enjoy working with other Christians in witness and service. We seek to be faithful to Christ's call to preach, teach, and heal in our community, throughout the nation, now and to the end of our time. 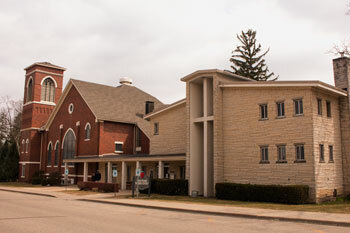 mid-week Lenten Services, Vacation Bible School, Sauk Prairie Ecumenical Council. Community involvement includes: collecting for and helping at the local Food Pantry, delivering Meals on Wheels, and providing pies for the community Thanksgiving Dinner. A pre-school, Girl and Boy Scout groups, Kids Companion, a basket weavers guild, and other community programs. With people who care about their church, their community and their world.